“Always-On-Display” is a great feature that is only available for some Android OEM smartphones. With this feature, you can see information displayed in a low-power mode even when your phone display turns “off.” That information usually includes a clock, notification icons, current battery percentage, and alarm. However, currently, the “Always-On-Display’ feature is only available for Samsung Galaxy, Pixel and LG phones featuring OLED/Super AMOLED display. Other OEM Android smartphones have not yet received this feature. But, thanks to an XDA member, he managed to successfully add the “Always-On-Display” (AOD) feature to the new OnePlus 6T. 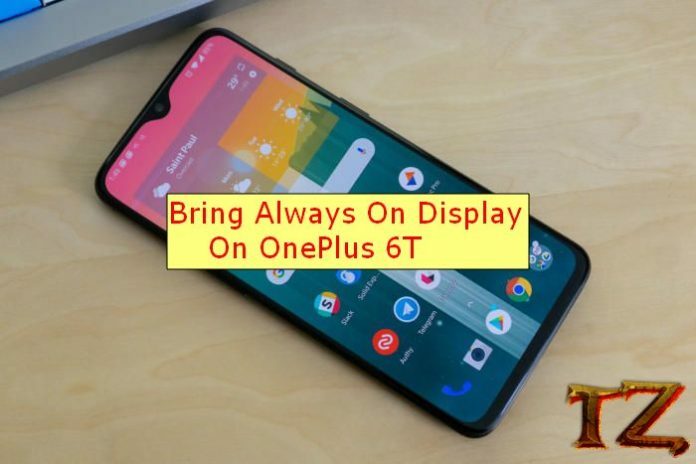 If you are using a OnePlus 6T and want this feature on your phone, then read on this post. Before getting started, you should note that I’m not responsible for any damage to your OnePlus 6T. Since it’s just a basic mod, there are no additional features, it just enables AOD feature on your phone. You should first unlock bootloader, install TWRP recovery and root your OnePlus 6T. All the things can be done in this post. Once you have successfully installed TWRP and rooted your phone, download this zip file and copy it into the internal storage of your OnePlus. Some OnePlus 6T users have reported problems after uninstalling it, when it uses OMS overlays and causes bootloop in OxygenOS ROM. Simply flash this file to fix the issue. I recommend you to only disable it in the settings instead of uninstalling it. If you deal with a bootloop after removing the mod, simply boot your phone into TWRP recovery and delete /data/resource-cache to fix the problem.